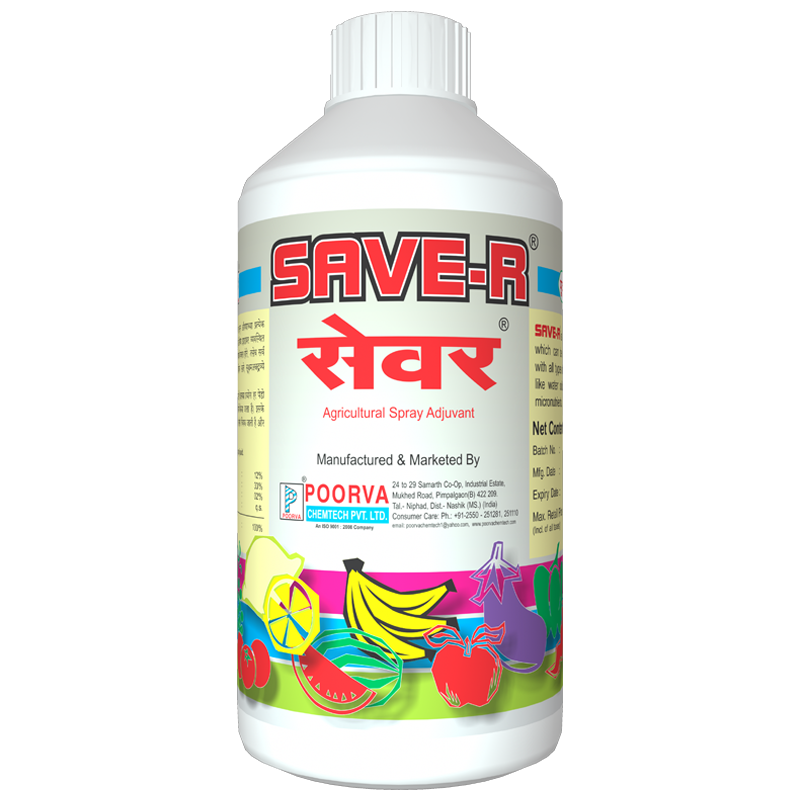 Saver is an Agricultural Spray Adjuvant & Surface tension reducing agent of high quality formulated by Poorva Chemtech (P) Ltd, Nashik through indigenous technology. Saver is an Agricultural Spray Adjuvant & Surface tension reducing agent of high quality formulated by Poorva Chemtech (P) Ltd, Nashik through indigenous technology. Save-R is the brand name in Technical Spreaders. It has been widely accepted by the farmers as the farmer sees the best multiferous results of Save-R. It is used on a large scale by farmers through various sprays. Save-R has unique action of sticking, wetting & spreading. It makes the spraying solution homogeneous. Save-R is an all purpose spray adjuvant that can be used with pesticides, fungicides, weedicides, growth substances and all kinds of major and minor nutrients. When used in spray solutions it increases the effectiveness of the ingredients of the solution. Saver does not allow the spray to get washed out even on rainy days because of its excellent qualities. Save-R is an all purpose adjuvant to spray solution that helps to stick and spread on all plant parts and does not allow the solution to wash out in rains. Provides more uniform spray deposit on plant surfaces and improves coverage of solution. Improves the effectiveness of the ingredients of the solution. Is non-corrosive to spraying equipments. Helps in effective control of the noxious pests like mealy bugs, scale insects and borers. Increases the effectiveness of spray due to which production is increased and quality of the product is highly improved. Saves quantity of solution and thereby saves money. It has given astonishing results on all the glossy leaves such as banana, onion, pomegranate, colocasia etc which is its unique character. In herbicide solutions - 1 ml/ lit of solution.